Ask Steve Roberts how fast he can go on his 8-foot-long recumbent bike. It’s all in the knee-high handlebars under the seat. Roberts has equipped them with eight typewriter-like keys he uses to control the two computers in his custom-made dashboard. He has memorized more than 100 combinations of keys the computer translates into letters and commands. They allow him to write as he bikes. He runs his consulting and writing business as he bikes. He talks by computer to people across the country, then visits them. Roberts, 35, rolled into the K mart Greater Greensboro Open this week, briefly distracting the golfers and promoting a book he hopes will finally earn him a decent wage. With him was his companion of two years, Maggie Victor, 35, whose bicycle appears simple only compared to Roberts’. Wearing helmets plugged into the bikes like telephones, she and Roberts communicate by radio as they cycle along, as they have for thousands of miles across the country. Lately, Roberts does it to make money. 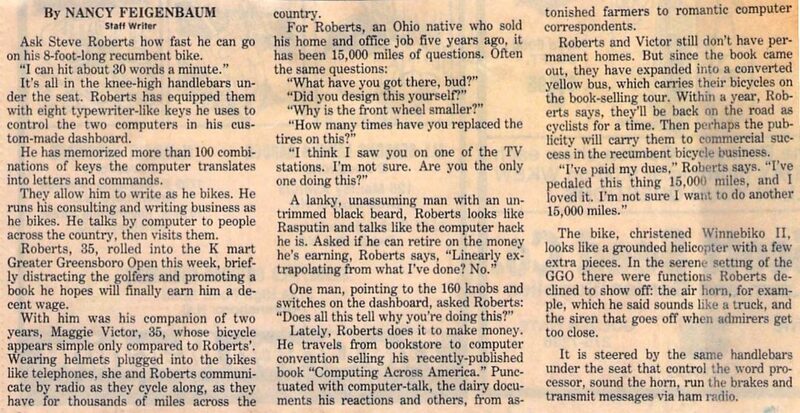 He travels from bookstore to computer convention selling his recently-published book “Computing Across America.” Punctuated with computer-talk, the dairy documents his reactions and others, from astonished farmers to romantic computer correspondents. Roberts and Victor still don’t have permanent homes. But since the book came out, they have expanded into a converted yellow bus, which carries their bicycles on the book-selling tour. Within a year, Roberts says, they’ll be back on the road as cyclists for a time. 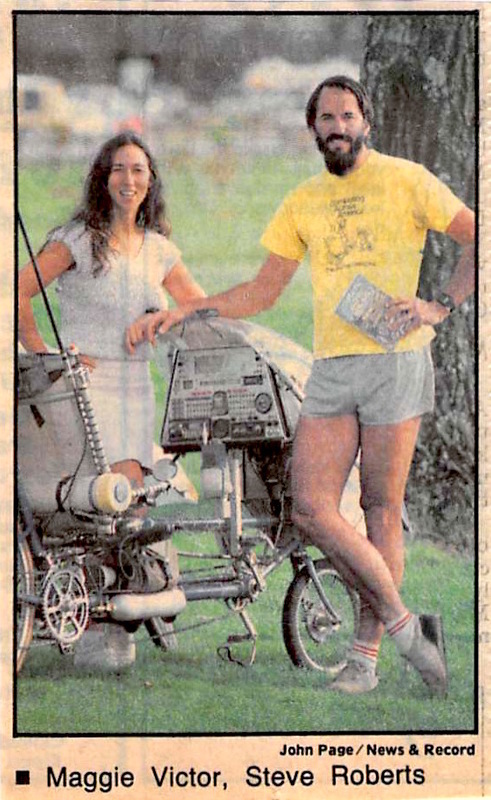 Then perhaps the publicity will carry them to commercial success in the recumbent bicycle business. The bike, christened Winnebiko II, looks like a grounded helicopter with a few extra pieces. In the serene setting of the GGO there were functions Roberts declined to show off: the air horn, for example, which he said sounds like a truck, and the siren that goes off when admirers get too close. It is steered by the same handlebars under the seat that control the word processor, sound the horn, run the brakes and transmit messages via ham radio. 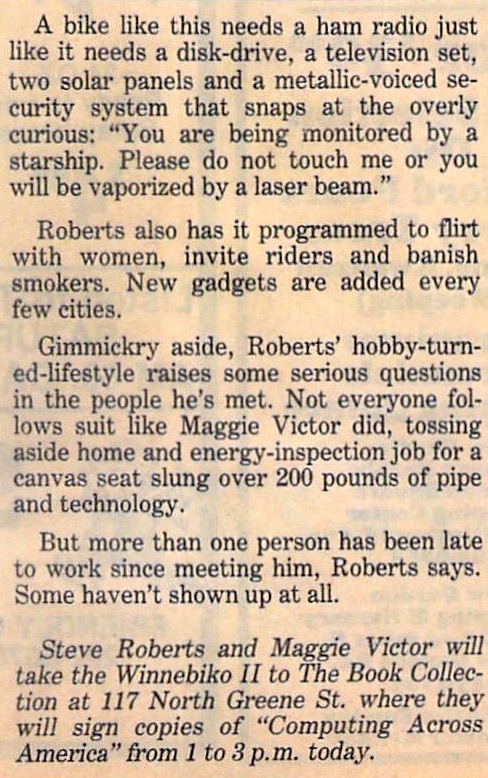 Roberts also has it programmed to flirt with women, invite riders and banish smokers. New gadgets are added every few cities. Gimmickry aside, Roberts’ hobby-turned-lifestyle raises some serious questions in the people he’s met. Not everyone follows suit like Maggie Victor did, tossing aside home and energy-inspection job for a canvas seat slung over 200 pounds of pipe and technology. But more than one person has been late to work since meeting him, Roberts says. Some haven’t shown up at all. from 1 to 3p.m. today.